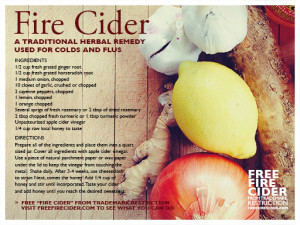 Fire Cider recipe cards. 4×6 card can be printed at your local photo lab. Click to download. Not too long ago, the Willimantic Food Co-op posted a photo of their beautiful make your own Fire Cider merchandising display. This display was made possible because of the support that the movement has been given from the herbal community far and wide! Inspired by this, we pulled together some lovely printable materials for each of you to distribute in support of the movement. These materials can be provided to retailers to share with customers, use in displays, or given away at check out. Individuals and schools can use these by adding them to community bulletin boards, sharing them with associations they are involved in, or passing them out at conferences and meet-ups – the possibilities are endless. Please, use them freely and often. They are a good way to start the conversation with your local store or other individuals, if you haven’t yet already. In addition, continue to voice your opinion to stores near you, be sure to check out the resources page for a sampling of boycott letters. 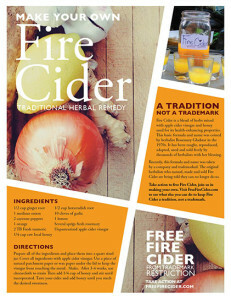 Make Your Own Fire Cider Recipe Cards – lovely little cards with a basic fire cider recipe. You can hand them out at farmer’s market, leave them on a table as part of a store display, or just give them to all your friends! Print these 4×6 cards at your local photo lab, be sure to ask them not to resize the file. Or you can print the PDF version of the Recipe Card from your own printer. 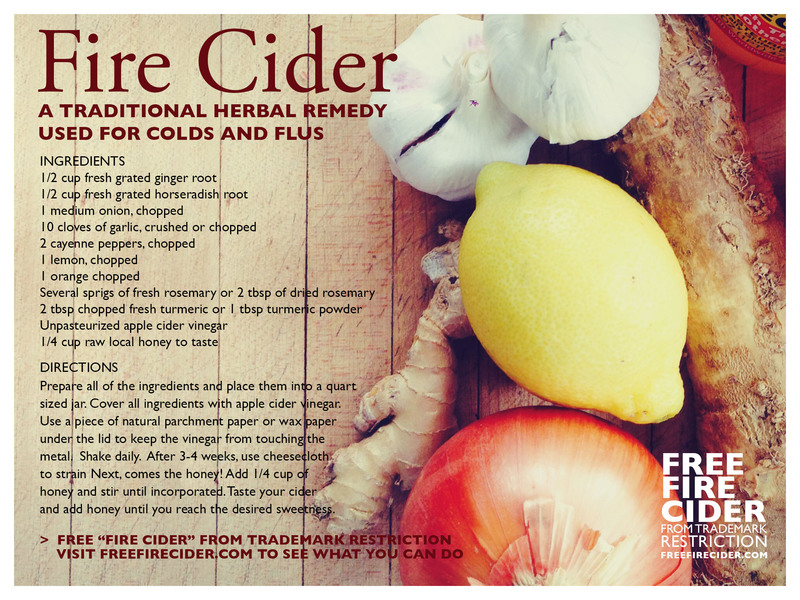 Make Your Own Fire Cider Poster – can be displayed in local stores, farmer’s markets, classes you teach in your own kitchen: anywhere! Includes a recipe as well! 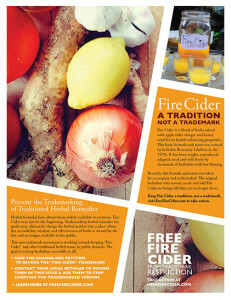 Free Fire Cider Poster/Flyer – an 8.5×11 poster/flyer with information about the trademark we’re fighting and why the trademark is a problem for the future of herbalism. Make Your Own Fire Cider Poster. Click to download. Free Fire Cider Poster/Flyer. Click to download. This entry was posted in Boycott, Resources on February 24, 2014 by admin. I am very disappointed that the local coop in Amherst, MA called ALL THINGS LOCAL has decided to carry Shire’s Fire Cider. They told me (and I am a member who said not to do it) they made the decision after meeting with the company because Shire told them if they hadn’t patented the name “someone else would”. I explained how upset herbalists are but they didn’t seem to get it. Can you please contact them?